The above photograph gives a panoramic view of The Chipperfield Ranges, Baldwin's Gate, Newcastle-under-Lyme, Staffordshire, ST5 5EA. All users of the The Chipperfield Ranges, Baldwin's Gate, Newcastle-under-Lyme, Staffordshire, ST5 5EA, must be aware of and comply with the information contained within the Range Standing Orders and Code of Conduct. The Staffordshire Smallbore Rifle Association's website (www.staffordshire-sra.org.uk) contains links to other websites of interest. However, once you have selected any of the links in order to leave our site, you should note that we do not have any control over any other website. Therefore, we cannot be responsible for the protection and privacy of any information which you provide whilst visiting such sites, and such sites are not governed by our own privacy statement. 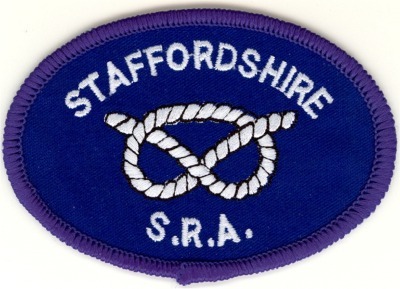 The above picture shows the Staffordshire Smallbore Rifle Association County Team Members Badge. View the NSRA (611) Inter-County Reserves League 2017/2018 - Division 5 - Staffordshire County Team - Partial Season's Results in PDF format. View the NSRA (611) Inter-County Reserves League 2016/2017 - Division 6 - Staffordshire County Team - Full Season's Results in PDF format. View the NSRA (611) Inter-County Reserves League 2015/2016 - Division 5 - Staffordshire County Team - Full Season's Results in PDF format. View the NSRA (611) Inter-County Reserves League 2014/2015 - Division 5 - Staffordshire County 'A' Team - Full Season's Results in PDF format. View the NSRA (611) Inter-County Reserves League 2014/2015 - Division 8 - Staffordshire County 'B' Team - Full Season's Results in PDF format. View the NSRA (611) Inter-County Reserves League 2013/2014 - Division 6 - Staffordshire County 'A' Team - Full Season's Results in PDF format. View the NSRA (611) Inter-County Reserves League 2013/2014 - Division 9 - Staffordshire County 'B' Team - Full Season's Results in PDF format. To view PDF format documents which appear on this website you need to have Adobe Reader, or similar, installed on your computer. You can download the Adobe Reader software by selecting the link to the Adobe website (shown below) where further instructions will be given. Download Adobe Reader by selecting this link to visit the Adobe website.